Nothing enhances the beauty or improves the value of your home like new siding. KG Roofing specializes in installing the latest, most advanced siding materials that not only beautify your home, but also improves energy efficiency, reduces noise and air pollution, repels insects and rodents, decreases or eliminates the need for painting and maintenance. Siding comes in a variety of styles, patterns, colors and finishes. Our experts can help you match quality siding products with your homes architecture, your vision and your budget. Low price and minimal upkeep make vinyl by far the most popular siding material. Vinyl needs no painting. It won't warp or twist, and it's impervious to insects and water. But it can rattle, crack, melt, and burn. Some vinyl products may look like wood from a distance, but not up close. Before you settle on vinyl, consider your style preference or whether the architecture in your neighborhood makes the added realism and cost of plastic, fiber cement, or even real wood a more appropriate choice. 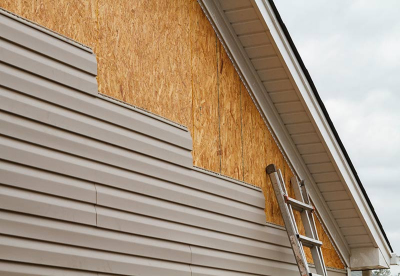 Water-resistant types of siding will have longer life spans. If you're installing the siding on your own, make sure it is within your skill set, requires no special tools, and creates no harmful dust when cut. Check the R-value rating for energy savings and understand what will be needed as far as insulation beneath the cladding. Your siding will be in full view as you come and go, so make sure it is beautiful to you. Make sure the siding has the versatility to meet the varied needs of your specific project. If there are aspects of your home's exterior that will make using a particular type of siding more challenging than others, make sure you understand what the added costs or necessary adjustments will be. Does it have the strength to resist temperature shifts present in your climate? How does it stand up to everyday wear and tear?